PHOTO: Allen Ramsey, DWCPhoto.com. Highlands running back Jared Pulsfort (3) looks to break a tackle in Friday's win over Dixie Heights. Highlands has rushed for a combined 722 yards in two playoff wins. In a season filled with unfamiliarity for both football teams, one familiar thing is a fifth straight region championship meeting. Thus, the Covington Catholic Colonel faithful may not be singing it, but the dreams best described by the Ryan Star Song of "This Could Be the Year" their beloved Colonels (5-7 overall) break the 14-game losing streak to the host Highlands Bluebirds (7-5) started again knowing there's another chance Friday. But the hosts again hope to post another N-O-T to those notions and capture another region championship. Game time is Friday at 7 p.m.
That's why the Bluebirds seek heavy improvements between the regular season game and playoff rematch with the Colonels. Highlands edged CovCath, 14-10 on Oct. 17 in Park Hills. "As individuals, we've improved. As a team we've improved," said Brian Weinrich, Highlands Head Coach. "As coaches, we've improved. It's us understanding our guys, our guys understanding us and knowing what it takes to be successful. It changes year-to-year and sometimes changes week-to-week." Highlands owns 32 region championships in school history including the last eight seasons. That ranks second in Kentucky history to Mayfield's 34. The Bluebirds hope to repeat what 11 other teams in school history did including the previous four. That is beating the arch-rivals in both the regular and postseason games. They also hope to avoid the fate of the 1997 and 2001 teams who beat CovCath during the regular season, but lost the playoff rematch. The key for Highlands is to continue dominating the way it did in the first two playoff games. The Bluebirds beat Woodford County (50-14) and Dixie Heights (52-21) in convincing fashion outgaining them 883-459 in total offense including an astounding 722-215 on the ground. The Highlands offensive line has been creating holes in its Spread offense, allowing the running backs to hit the second levels and above, break linebacker and defensive back tackles then go off to the races. Highlands senior Nick Kendall ran for 238 yards on 16 carries and two touchdowns in the win over Dixie Heights to go over the 1,000-yard plateau with 177 carries for 1,117 yards and 16 touchdowns. "I think it will be difficult to continue (running well) as we play against tougher teams," said Evan Richardson, Highlands senior center. "But we've been working a lot more on it and getting better every day. I think it will pay off in the end to have a nice running game established and I think it will be a big part of our offense as we progress into the postseason." The Bluebirds average 191.2 yards per game rushing the ball. Junior Grant Murray has 53 carries for 475 yards and six touchdowns and junior Jared Pulsfort has 59 carries for 357 yards and three touchdowns. Highlands has not had to pass the ball much in the first two playoff games. But the passing game has shown signs of light when the Bluebirds have thrown the ball. Senior quarterback Austin Hergott has completed 114-of-214 passes for 1,352 yards, 12 touchdowns and 12 interceptions. "That's where we've been somewhat successful," Weinrich said. "Even in the games where we've had success running the ball lately, it wasn't just blindly running plays. Our guys did a good job of adjusting their blocking schemes or coaching adjustments on the sidelines. Even this past week, we ran a play that we didn't think was going to be there. We ended up counting on it heavily." Kendall still leads the Bluebirds with 23 catches for 143 yards and three touchdowns but senior TJ Sipple has 21 catches for a team-high 279 yards and a touchdown. After senior Chandler New, a pair of sophomores in Griffin Huber and Braden Posey have 12 catches each for 178 yards, a touchdown and 144 yards receiving respectively. Highlands senior wide receiver Mitch Cain has gotten back into a groove after missing five games because of injury. Cain has 11 catches for 116 yards and hauled in his first touchdown pass of the season against Dixie Heights on Friday. The Bluebirds will face either a 4-4 or 4-3 CovCath defense. Junior defensive lineman Alex Shelton leads the Colonels with 99 tackles and senior defensive lineman Jacob Steins has a team-high two fumble recoveries. Senior defensive back Adam Piccirillo owns a team-high three interceptions for CovCath. The Highlands 3-4 defense contained Covington Catholic in the 14-10 win and has improved each week. Teams average 199.1 yards per game rushing against the Bluebirds and 139 passing. 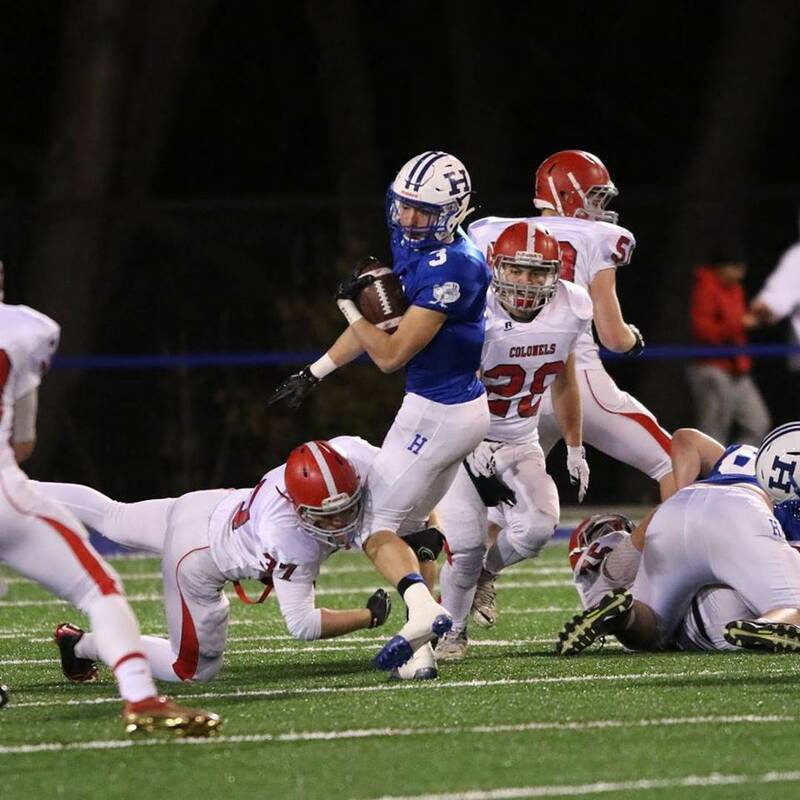 The Bluebirds did well penetrating the Dixie Heights backfield and making plays. Senior nose tackle Tyler Robinson leads Highlands with 11.5 tackles for a loss and four quarterback sacks. Senior defensive lineman Luke Lindeman has 5.5 sacks. CovCath also runs a Spread offense with sophomore quarterback AJ Mayer leading the team in both rushing and passing. Mayer has 559 yards rushing on 127 carries and eight touchdowns to go with 140-of-293 pass completions for 1,814 yards, 15 touchdowns and 12 interceptions. Mayer hands the ball off to several running backs in junior Anthony Best, senior Ryan McGinness and sophomore Grant Dyer. Best owns 417 yards rushing on 71 carries and six touchdowns and Dyer has 94 carries for 345 yards and four touchdowns. "They do a pretty good job of watching what you're in and making some play-calls based on that," said Shelby Jones, Highlands Defensive Coordinator. "We definitely have to be sound and trust in what we're doing. As long as we line up and play like we can, continue to build that confidence and play hard, I think we'll be in good shape." McGinness leads the Colonels in receptions with 38 for 545 yards and five touchdowns. He also has 73 carries for 393 yards and three touchdowns. But freshman Casey McGinness has come up and given the Colonels a spark on offense breaking off some long runs in their region semifinal 28-7 win at Madison Southern. He has 18 carries for 201 yards and three touchdowns. "No matter what team you're playing, you have to read your keys," said Ben Ziegler, Highlands senior linebacker. "If you don't read your keys, you're always going to mess up no matter what you're doing. It's the same every week." Highlands saw Bradley Greene intercept a pass against Dixie Heights and Austin Mayhew return a fumble back 33 yards for a touchdown. Greene leads the Bluebirds with four interceptions. Trey Bowden, Drew Bravard and Sam Taylor have two fumble recoveries each. Greene has also become a force on special teams. Greene has 16 punt returns for 295 yards and 11 kickoff returns for 298 yards and a touchdown. Senior Jared Dougherty's left leg could be crucial in a close game. Dougherty has made 7-of-11 field-goal attempts on the season and 37-of-38 point-after kicks. Dougherty owns 198 career point-after attempts good for seventh in Kentucky history. Highlands leads the all-time series, 48-17 over Covington Catholic. The last time the Colonels beat the Bluebirds came in 2006. CovCath won the regular season and postseason meetings that year on its way to the last of six state championships. Dougherty is left footed. He also hasn't missed an extra point. A fumbled snap isn't an extra point.